Hello! I hope you’re enjoying the Blog Tour de Troops. You were probably just on Anne Tibbets blog Will Write for Coffee where your comment earned you and a soldier a free copy of her young adult adventure The Beast Call. After you’re here done please visit Susan Salluce Sip N Share with Susan and get a copy of her Dramatic novel Out of Breath. If given the choice between my life and my daughter’s, without hesitation I would choose hers. Like most people, if asked to risk my safety for the lives of my closest friends and family, it would only take me a moment to decide that I would. But if we’re truly honest with ourselves, how many of us would risk our safety and our lives for a stranger? Or for an ideal? That’s exactly what the men and women of our military forces do every day. Without question or hesitation they do whatever job needs to be done, wherever it needs to be done. They keep us safe. They protect the ideals of civil liberty, human rights and our freedom. They sacrifice being close to their loved ones, and the comforts of home for us. Today through the 14th, just by commenting, you can give a little back to them. Thank you! for being part of this wonderful tour. Your book looks like a fantastic read. (I love the cover with those eyes!! )Thank you for your generosity and support for our troops! I love this idea for the tour! Joannie is having trouble leaving a comment, so I'm leaving her comment for her. so glad to see so many authors participating this time around on the tour! Thank you for supporting our troops, being a military wife it brings tears to my eyes. Hi! This is a wonderful thing to do! I already have a copy so donate mine to another solider :) whoooot! 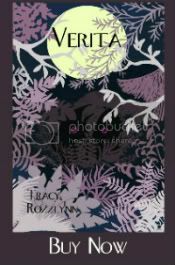 Not only was this a lovely post to read but your book cover is beautiful. I'd love to read it! Great site. Would love to get a copy. Thank you for the support of our troops. I think this is great what you are doing for our soldiers. What a great cause. Your book sounds like it would be awesome. thank you. this is a great cause! Great Event - thanks for participating! This is such a great cause!! Thanks to all our troops & their families for all the sacrifices they make. Thank you so much for participating in this! God bless all our soldiers, past, present, and God forbid future. You are to be praised for donating your time and talent to such a worthy event! Thank you for the chance to read your book and pass one on to a deserving soldier. Thank you for taking part in this wonderful event. The union I belong to at work sponsors a troop every year and we have just had so much support. Every month since September we have been mailing care packages to our sponsored troop. Thanks for participating in the blog tour and donating books. Thank you for supporting the troops! This tour is a wonderful idea! Thank you for supporting the troops. As the wife of an active duty soldier I am so proud of our men and women serving this country. The sacrifices they and their families make do not go unappreciated. Thank you is such a small offering to those that serve. I love you honey, come home safe. The girls and I miss you and are so proud of you for doing all you do. It is amazing to me that someone who has never met me, without question, would fight and die for me! WOW!! Thank you to all current and past soldiers! Thanks for participating in this great tour. I have several family members who are veterans or still actively serving, and it is so nice to see people giving back! Thank you so much for what you are doing for our troops you are such a blessing! Great Cause! Happy to help! Wanted to comment to get a copy to a soldier and stop by to say Hi! Have a great tour!! Thank you for supporting our groups! What a wonderful cause. I love your cover art. Awesome blog tour with a great cause! Thanks for the read too! This tour is in support of a terrific cause. And yes, I would love a copy of Verita. Thanks! I would enjoy a copy of the book and thanks for being part of such a wonderful tour. What a wonderful way to support our men and women serving so courageously every day. Very beautiful idea! Thank you very much. Thank you so much for helping the troops! Thank you so much great blog tour for the troops! This book sounds great also Darkened shadows is a book I would love to read sometime Love the cover! Thanks again too all the great Authores My dad was in the Navy for 30 years! thank u for this awesome tour! I would love to read your book, and I'm sure our troops will, too! !Thank you so much for participating!! I love discovering new authors. Thank you Tracy! So many soldiers are going to receive books soon. I love it! Thanks for supporting our troops..looks like a great read. Great cause! Your book looks very interesting. This is such an amazing thing you are doing. Thank you so much. Thank you for taking part in this great tour. I would also love to read your book. Thanks for supporting the troops. Please send my copy to the troops as well. Thanks again. Another author on the tour stopping in. 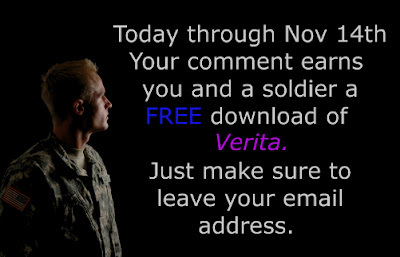 Here's to a lot of comments, a lot of traffic, and a lot of ebooks for soldiers. Thank you so much for being a part of this. As the mother-in-law of someone in the service I can't tell you how much all this support from "back home" means to our service men and women. Thankfully our soldier is leaving Iraq soon and will be home in time for Christmas, but so many are still serving in so many places. I really enjoyed our blog site. This tour has really driven home for me what our service men and women do for us. Thank you for doing this. You can count me as one of your fans. I, for one, certainly appreciate what you are doing here. And I most whole-heartedly share your interest in supporting women warriors in fiction, but perhaps, more importantly, in real life. I deeply admire our troops or anyone, for that matter, that would willing stand in harm's way for the benefit of another. Thanks for the free read! Excited to read it and thank you for also supporting our troops!! 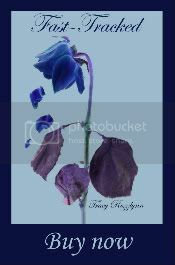 Hi Tracy - your post and the way it was set out was very very touching. Thank you for taking part in such a wonderful event. 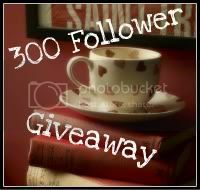 This is an awesome giveaway! Thanks for giving us all the opportunity to do something for the troops! Thanks for hosting. Thank you for supporting out troops this way (and I have to say that I'm going to enjoy it too). My father, husband and brother-in-law have all served or are currently serving and anything that supports our troops is near and dear to my heart. Thank you for participating in the Blog Tour de Troops! Such a great cause. Looking forward to reading your book. What a great way to support our troops! From a fellow author on tour, I agree---it's most definitely a powerful cause we support. Thanks for taking part! Great post Tracy. With every blog I read on this tour, I'm finding it more and more intimidating being the one to wrap everything up. Thank you for supporting our troops!! It is a lovely thing that you are all doing! What a great cause - thanks for supporting our troops! I look forward to reading your book! I'm so thrilled this has started. It's always wonderful to recognize those who served out country! What a wonderful way to show support to those serving or have served. Happy Veteran’s Day. My father served in the Korean war. Thank you for being on this tour. I am thankful for every freedom I have. And I am truely thankful for all the men and women that serve. Thanks for this wonderful observance of Veterans Day. This is such an amazing blog hop! Thanks for participating. Thanks for taking part in this worthy endeavor for the soldiers. You are right about fighting unselfishly for others and that is why we honor them. Huh...could have sworn I posted here. Oh well, second time should work! Love this support towards the brave people who fight for our lives. Thank you for being part of this Blog Tour! I love the covers of all your books. Thanks for sharing with everyone. This is a great project and wonderful cause. A great way to observe this special day. What a great way to honor and give to the people who serve our country. Thanks for participating. I know I've said this before but God Bless You and the others for doing this blog.I know how much the soldiers will love their books . And this is a wonderful way to celebrate all together! Thanks for being part of this tour! This is such a great cause. Thanks to all the troops & their families for their sacrifices. Here for the Blog Tour - Thank you to all of the men & women of the armed forces for everything you do and for keeping our country safe! Thank you so much for being a part of this!! This is such a good idea for a tour. Thank you for participating in the tour. I look forward to reading your book. Thanks so much for doing this! I lost my dad in '89 from cancer as a result of his service in Vietnam. I appreciate this so much! What a wonderful way to support our troops. Thank you. Thank you for being part of the tour and supporting the troops! This is a wonderful idea! Thanks for supporting our troops! I used to send care packages via 'Books for Soldiers', and this is an awesome way to continue that effort! Thank you for participating in this awesome event. I tried to follow yesterday and found myself so emotional about it I had to stop and decided to start again today. We all owe such a debt of gratitude to our troops and veterans and to even be able to do this little part by making a comment is such a blessing. Thanks for helping the troops, Tracy! What a great idea! 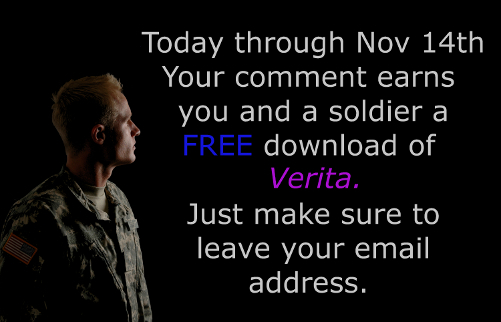 Thank you for supporting our troops through this blog tour. Thank you for what you are doing its a great way to say thank you. Thank you to all who serve or have served in any party of the military. What a wonderful idea! I support our Veterans 100%. I was really moved reading Terri Long's blog post on Nina Gilberti's tremendous documentary. I can only imagine what they've gone through and still suffer on a daily basis. They and their family deserve so much more. God Bless each and every one of them. So glad to see you as a part of this tour. So glad to be a part of this worthy endeavor. Thank you for allowing us an opportunity to thank the troops. Thanks for participating in this great event! Thank you all for showing some love to our Service people. It's really nice to see how many of the authors care about are military. I'm so glad there's another Tour de Troops!! Can't wait to see if there's more comments than Memorial Day! What a great way to give our troops a little escape in a book while they are away from home and at war. Thanks IndieBookCollective!! Thank you for your participation in this tour, my first year doing this and I think it's fantastic! Thank you for our troops, and thank you for being a part of this. It is such an amazing thing that all you authors are doing! I cannot wait to read a copy of your book. This is a great thing for our troops. I'm sure they will appreciate it. You are awesome for supporting our troups this way!!! Thank you to all Veteran's and those still serving today! If you could send her one to, I'd be grateful. Happy to support a good cause. Thank you for being part of the tour. please donate my copy to a soldier. Thanks for your support of the troops. They are great and really deserve this! This is such a great thing. Thanks! Thank you so much for supporting our troops and for doing this. Your book looks like an interesting read. The troops are awesome for what they do and I've never really thought of them as risking their lives for stangers. It puts a new light on how so greatful we should be for them. So happy to participate in this wonderful blog tour. Thank you! Thanks so much for supporting our troops! My dad and hubby are Marine Corps veterans. Semper Fi! Thank you for participating in this wonderful project, and thank you to our veterans for their service! 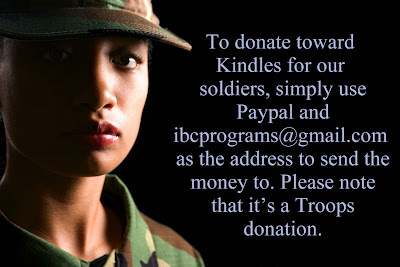 IBC is so great to do this for our troops & allow us to show our support in such a creative way. Win-win for everyone. Wish all the world's problems could be solved this way. Thanks for donating your book. Thanks for supporting the troops.